BioTelemetry's superior cardiac monitoring services are being used by Apple in its Heart Study featuring its watch and app at Stanford Medical. Healthcare services is the future for Apple as well as for BioTelemetry in its latest acquisitions of Geneva and LifeWatch. Attractive entry points for both stocks as Apple continues to be undervalued and BioTelemetry has traveled into oversold territory again. Apple Inc. (AAPL) and BioTelemetry Inc. (BEAT) have teamed up as partners in Apple's Heart study preparing the way for future healthcare disruption via remote monitoring. The world is moving towards more and more accurate and reliable remote monitoring devices such as Apple's Watch, along with apps and services for cardiac and other crucial healthcare issues. Apple and BioTelemetry are both innovating tremendously in the space, while BioTelemetry continues to build scale and depth in monitoring hardware and services with its latest acquisitions of LifeWatch AG and Geneva Healthcare. The future looks bright for both companies as the stock of either company appears to be a bargain for investors with long-term disruption hopes. In November of 2017, BioTelemetry grabbed a key role in Apple's Heart Study being conducted at Stanford's Medical School. BioTelemetry's devices and software are being used in conjunction with Apple's Watch primarily to discover undiagnosed irregular heart rhythms using a dedicated app created by Apple. Enrollment in Stanford Medicine's study concluded last August in 2018 with data starting to roll out, including the finding that Apple's Watch can, in fact, detect irregular heartbeats in a presentation given at the American College of Cardiology. Data from the large study indicated that 84% of the irregular pulse notifications sent from the Apple Watch were later confirmed to have been atrial fibrillation episodes. These proof of concept results should provide Apple all the incentive it needs to further pursue its current course of making additional significant investments into both wearable healthcare products and services to support those devices, including those that BioTelemetry specializes in as an industry leader. Tim Cook, the CEO of Apple, has stated that it is his aim to make a "significant contribution" in the healthcare field as he sees healthcare as more of his potential legacy than the iPhone. "I believe, if you zoom out into the future, and you look back, and you ask the question, "What was Apple's greatest contribution to mankind?" it will be about health," Cook was recently quoted as saying, making his intentions moving forward pretty clear. BioTelemetry also has remote monitoring in healthcare squarely in its sites as well as it continues to stay ahead of its competition in growing and expanding its devices and services. BioTelemetry acquired LifeWatch AG in an ~$280 million deal in July of 2017 and just recently completed its newest acquisition of Geneva Healthcare at the beginning of 2018 for $45 million upfront, along with a potential $20 million in additional earn-outs. BioTelemetry sees double-digit growth for the foreseeable future as it has given shareholders 26 consecutive quarters of year-over-year revenue growth, according to the company's latest conference call. BioTelemetry is planning on growing its Healthcare Services sales team by an additional 20% over the course of 2018 as it has now pretty much fully integrated LifeWatch's similar offerings, along with its European customer base as a former Swiss company, as it builds scale faster than much of its competition. Its Geneva platform addition will give it the ability to delve deeper and wider into the cardiac monitoring market with an innovative and proprietary cloud-based system that aggregates data from devices like pacemakers and loop recorders to remotely monitor a physician's patient. Physicians can use Geneva's platform as a single portal to order patient monitoring, view monitoring results, request device checks, as well as to help drive other efficiencies, including better patient compliance. 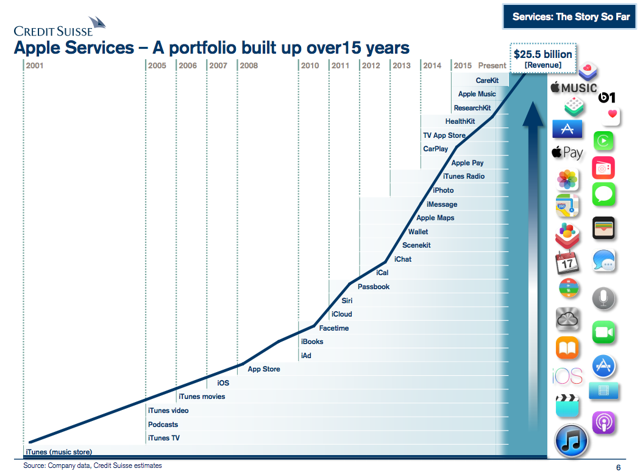 Apple services should be a prominent component of the company's future growth as it tries to wean itself off of iPhone dependence in the coming years. With the Products segment gross margin at 34.3% and a Services gross margin of 62.8%, according to its latest conference call, it is not hard to see why a greater shift to services might be in Apple's future as smartphones might become more and more commoditized in the not-so-distant future if innovation slows dramatically in the space. Morgan Stanley sees Apple as a leader in healthcare "digital disruption" as it looks to potentially seize a lucrative piece of the $3.5 trillion total addressable market that Morgan Stanley currently sees in U.S. healthcare. A successful shift to services for Apple away from its hardware base could potentially cause a rerating of the stock in the coming years as it could benefit from higher margins and a stickier ecosystem with some of the highest quality hardware and services in the sector. BioTelemetry is also currently undervalued as it has undergone a nice pullback from just a few months ago as its M&A premium seems to have evaporated. BioTelemetry continues to be an attractive M&A target, in my opinion, as Apple or any number of other healthcare companies might decide one day to just buy out the ~$2B market cap company. They would grab not only BioTelemetry's proprietary devices and software but also the company's extensive and loyal customer base both in the U.S. and internationally. Apple and BioTelemetry are working as partners with Stanford Medical as innovative digital healthcare disruptors are targeting a more remote monitoring world. Their innovation and growth are worth noting as both companies appear to be undervalued, given their future prospects if they can effectively disrupt the future of healthcare. 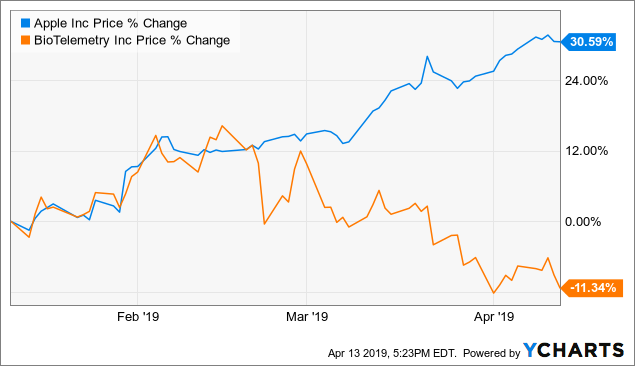 My current price target for Apple is $210 a share over the next few months as it tries to clear the $200 a share hurdle again, while my price target for BioTelemetry sits at new highs for the stock at $81 a share. Best of luck to all. Disclosure: I am/we are long AAPL, BEAT. I wrote this article myself, and it expresses my own opinions. I am not receiving compensation for it (other than from Seeking Alpha). I have no business relationship with any company whose stock is mentioned in this article.